There are regional trains from Koblenz or Cochem/Trier going to Moselkern hourly. From there take a cab to Burg Eltz. Alternatively there is a hiking trail from the Moselkern station to Burg Eltz (5 km, approx. 90 minutes). During the weekends and on holidays a bus is available. Use the highway A61 and take the exit no. 41 "Boppard". From here go ahead in "B327/Koblenz/Boppard" direction and follow the signposts to Münstermaifeld/Burg Eltz. The parking grounds are a few 100 meters away from the castle uphill. There's a shuttle bus available (2 € each way, status: 2014). During the weekends and on holidays there is a special bus line (line 330, called "Burgenbus") which brings the visitors directly to Eltz Castle from Moselkern station. Tickets cost 2 Euros each way (status: 2014). Eltz Castle (Burg Eltz) is one of the most famous and most beautiful fortresses in Germany. Like Cinderella’s fairytale-castle it’s throning above the Eltz creek valley and attracts numerous visitors. Did you ever wish to be a King or a Queen? Did you ever want to know how one feels being an earl or a countess? In this case, Eltz Castle (Burg Eltz) is the right place. The castle was built more than 850 years ago – and since then it was always in the ownership of one and the same family: the Counts of Eltz. It's been rebuilt extensively during the years 2009 – 2012, and it's a real treasure amongst Germany's castles at all. The Middle Ages come alive here – due to countless activities and performances organized by the Count and the Countess of Eltz. During its history, the castle was never destroyed. For many years (between 1961 and 1995) its picture was found on the backside of the German 500 DM banknote. Highlights are the unique architecture of the castle, a huge courtyard with more than 500 years of history, and the comprehensive treasury chamber. All this can be viewed during guided tours which are available in english as well. Suits of armor and medieval weapons like swords, halberds, flails and morning stars are to be viewed in a huge number as well as magnificent halls where glorious feasts were celebrated formerly. There are two self-service restaurants with altogether more than 300 seats available. Here the visitors can supply themselves with little snacks and drinks as well as coffee and cake – perfect for a small break. The castle shop offers many souvenirs. The hiking trail „Eltzer Burgpanorama“ is considered Germany’s most beautiful hiking trail in 2013. It’s approximately 12 km long and leads the hiker through the amazing Moselle landscape, passing Eltz castle amongst others. The „Eltzer Burgpanorama“ leads to the Moselle ridgeway which is altogether 185 km long. Cross chilling forests and enjoy the breadth of the Moselle valley. Moselle or Rhine are predestined for a river cruise. There are many tours available, for instance a tour to the Middle Rhine Valley and the Loreley cliff. Book a „Siebengebirge“ tour to the „Drachenfels“ where Siegfried killed the dragon according to the Nibelungen saga. 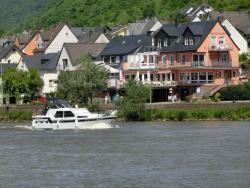 Or you choose a tour to Cochem or Trier with numerous relicts from the celtic and roman era. The Moselle region is Germany’s oldest wine region. There are numerous wine villages with countless vineyards around to taste and purchase wine. Taste the Riesling, the Rivaner, the Pinot Noir, the Pinot Blanc, the Dornfelder or the Cabernet Dorsa – all those kinds of grapes are growing in and around Eltz castle (Burg Eltz). Just 500 metres from the banks of Moselle River, Ferienwohnung Klaus offers an idyllic countryside location in Treis-Karden. It includes a fully equipped kitchen, cable TV and a furnished terrace. A stylish spa with 2 pools, a sun terrace, and full buffet breakfasts are offered by this 4-star hotel. Löf Train Station and the River Moselle are just 300 metres away. A fully equipped kitchen and bright interiors are offered at these family-run apartments in Oberfell. 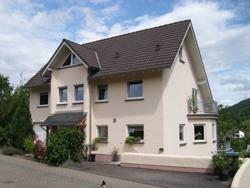 Ferienwohnungen Moselstausee offer great direct views of the the Moselle River.